As summer heat turns to crisp autumn air, fall festivals and Oktoberfests spring up across Chicago’s western suburbs! 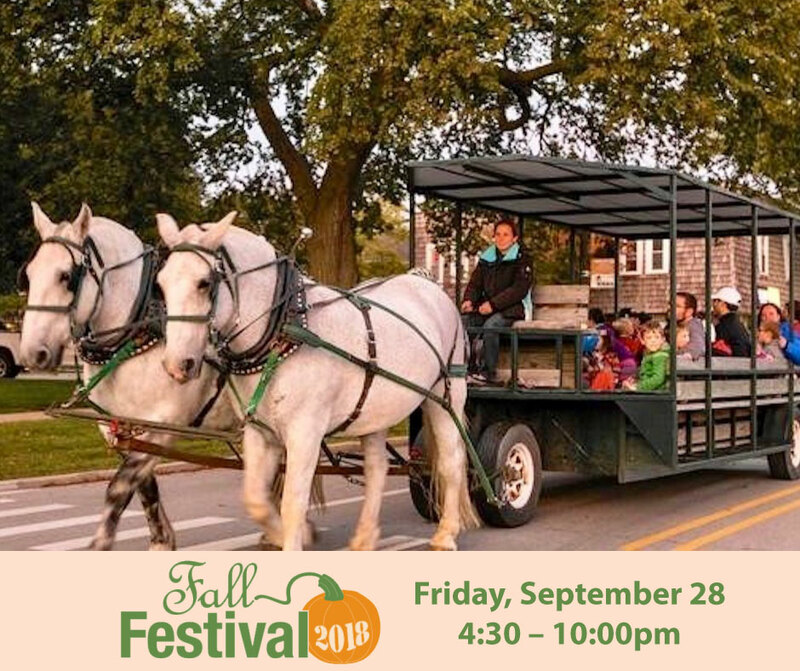 These family-friendly events usually feature seasonal fun (think hayrides, pumpkin patches, and cups of steaming cider) as well as fest favorites such as rides, live music, and food trucks. Oktoberfests add a German twist with traditional food, music, and the chance to raise a stein in the beer garden. 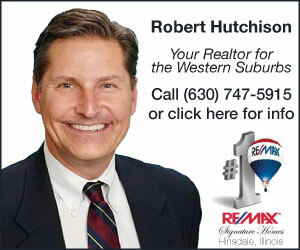 This article is sponsored by the Western Springs Business Association and the featured event listings. Join us for the annual Fall Festival in Western Springs! You won’t want to miss this free community event at the Tower Green. You can look forward to live entertainment from Mattix Music, School of Rock and our Headline Band, Good Things. Included in this free family event are hayrides, a petting zoo, storytelling and the ‘haunted water tower’. Don’t forget to bring your decorated pumpkin for the pumpkin decorating contest! New this year is the Craft Beer Tasting Tent sponsored by Solstice. $30.00 will get you multiple 5oz tastings from 13 Chicagoland breweries and a souvenir glass . As in years past, food and beverages will be available for purchase. This years’ vendors are Solstice, BB’s Baby Donuts, Old Town Red Hots & DayDream Coffee. 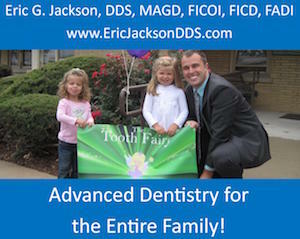 Click Here for more information about the event. Thank you to our headline sponsors Clarity Physical Therapy and Re/Max Properties of Western Springs. Food, drinks, bingo, live music, carnival rides and games. Local food, beer, wine, live music and a free family fun zone. Carnival, food, beer, wine, music and business expo. BBQ contest, rib sampling, live music, food, beverage booths and children’s activities. Bounce house, face painting, games, prizes, bake sale, popcorn and snow cones. Scarecrow contest, petting zoo, face painting, balloon artist, live music, pumpkin decorating, inflatables and chili cook off. Oaktoberfest takes your traditional Oktoberfest to the next level! This free two-day event on Friday, September 14th and Saturday, September 15th offers a premier music lineup featuring local and national artists, a Kids’ Root Beer Garden, as well as microbrew, wine and ethnic food offerings. 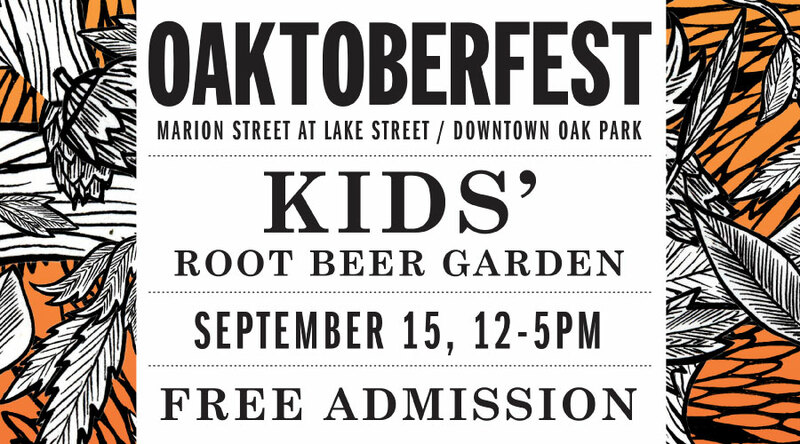 The Kids’ Root Beer Garden located on Marion Street on Saturday from 12:00 – 5:00 pm offers kids the chance to create and race their own zucchini cars. The Root Beer Garden will also feature a ninja obstacle course, root beer floats, and games and activities sponsored by local organizations. More information at www.oaktoberfest.net. Kick off your fall with Oktoberfest! The Fest offers authentic German fare from local vendors and establishments, beverages for both adults and kids alike; children and family based activities such as the Kids Zone, Brat & Donut Eating Contests; Live music including Polka, Classic Rock, local children’s talents, Karaoke and more. 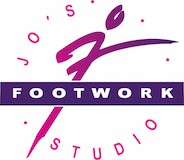 The best part… All ages are welcome!If you are interested in becoming a sponsor or volunteering… Please refer to the website link below for further information. We are always looking for people who are willing to help with events, and or sponsorship on many levels. PLUS new and enthusiastic board members! 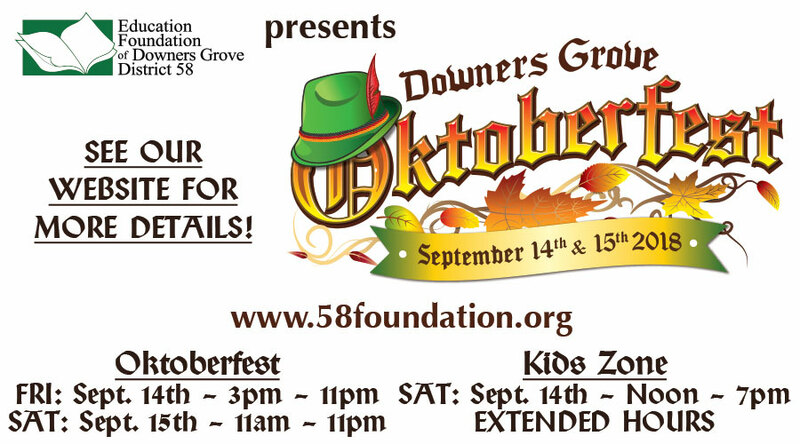 ALL PROCEEDS BENEFIT THE SCHOOLS SUPPORTED BY the Education Foundation of Downers Grove District 58! Live music, international food court, beer garden, carnival/amusement rides and family entertainment pavilion. Petting zoo, face painting, food and beverage vendors and seasonal fun. Hayrides, petting farm, craft fair, fall garden, model trains, historic-living demonstrations, and other old-fashioned fun. 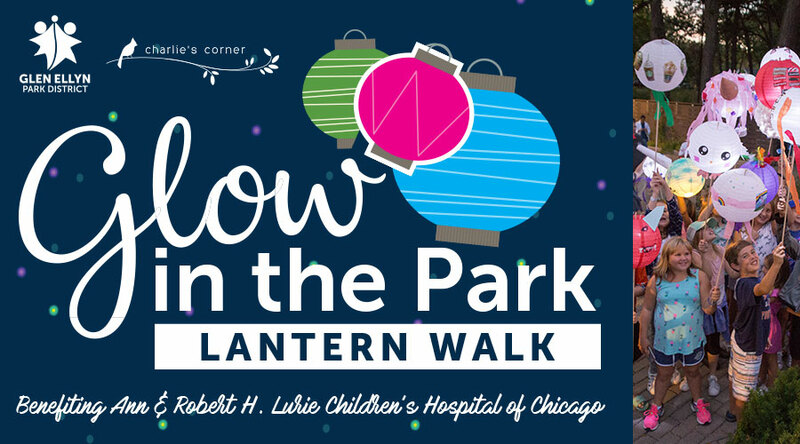 As night falls on September 16 at Lake Ellyn Park, the Glen Ellyn Park District will present an illuminated lantern parade around Lake Ellyn to benefit Ann & Robert H. Lurie Children’s Hospital of Chicago. The lantern parade will be preceded by free entertainment including live music from Tres Moustache and Bella Artes, Ben’s Bubble Show, face painting, and an inflatable climbing wall from 5pm-7:15pm. Walk in the parade! Decorate a lantern at the event ($10 fee; limited quantities) or bring your own creative creation from home. Lanterns are lit with LEDs, not flames. This event, is in partnership with Charlie’s Corner Foundation, is free to attend. Cash donations to Lurie Children’s are appreciated. 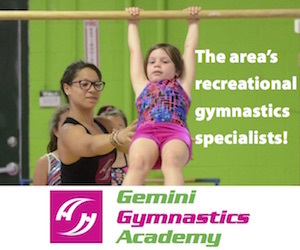 Learn more at www.gepark.org/glow. 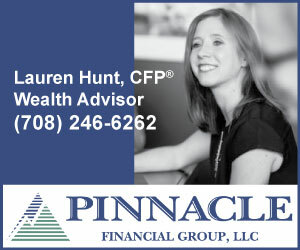 Luurs Garden & Flower Shoppe’s annual festival with pony rides, train rides, pumpkin bounce house, food and hot cider. Free family festival with live music, kids’ activities, food and beer. Games, horse rides, craft/flea market booths, hayrack rides, live music, farmer’s market and food. Dance, drumming, art, crafts, entertainment, and food. Horse-drawn hayrides, games, pumpkins, and local fall food. Laser light show, food trucks, kids activities, and glow race. Hayrides, petting zoo, carnival games, pony rides, pumpkin patch, inflatables, entertainment, and food. Race, live entertainment, kids activities, food trucks, and food contests. Hayrides, children activities, and make your own scarecrow. Pony rides, hayrides, games, and food. Traditional German music, beer and cuisine under a huge heated tent, and family-friendly activities. Scarecrow contest displays, live entertainment, make your own scarecrow, arts/crafts show, carnival rides, and festival food. Hayrides, pumpkin decorating, balloon sculptors, and live music. Scarecrow making, meet a beekeeper, animal program, pan for gold or minerals, live music, crafts, games, bake sale and pumpkin decorating. Games, a DJ, moon bounce, hayrides, face painting and candy hunt. Trick or treating, inflatable corn maze, face painting, magician, fall games, and food trucks. Fall craft show, music, hayrides, petting zoo, face painting, inflatables, pumpkin decorating, and food trucks. Food and beverages, crafter booths, hayrides, face painting, balloon artist, bonfire, DJ music, and 5k run/walk. Halloween craft, haunted hayride, corn maze, cookie decorating, scarecrow building, and costume parade. Ciders and seasonal beers. This event is for ages 21+. Pumpkin decorating, inflatables, entertainment, and carnival games. Creatively carved, lit gourds will be set afloat on Sunday, October 21. Before the Pumpkin Flotilla at dusk, enjoy live music from Jeanie B! 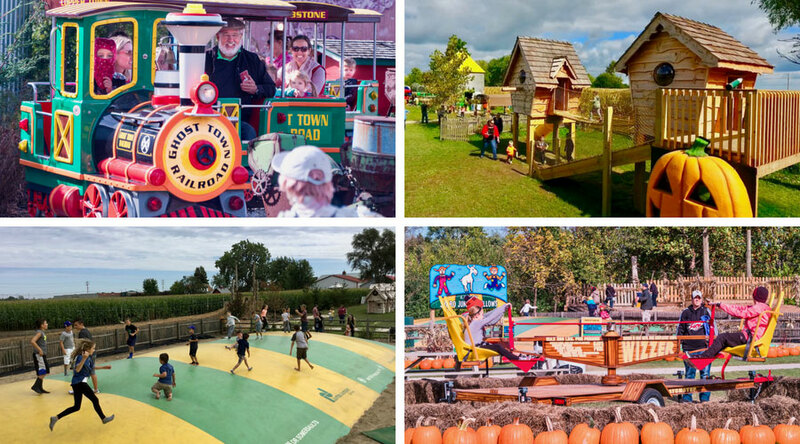 and the Jelly Beans, activities and games throughout the park, a giant pumpkin carving demonstration, trackless train rides, canoe rides, and bounce houses. 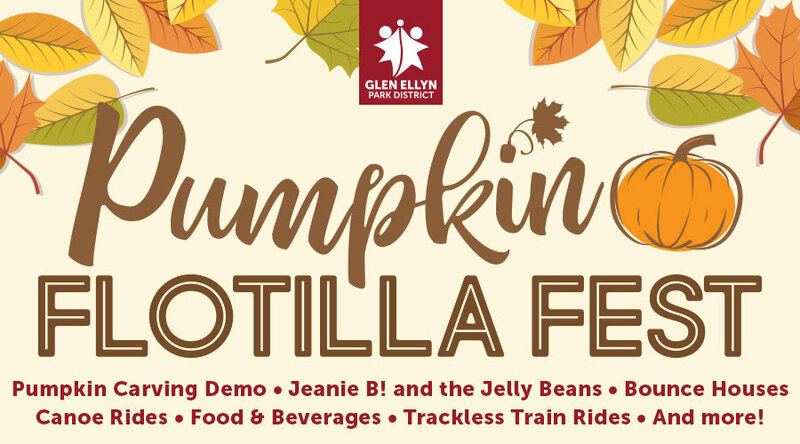 This free event, presented by the Glen Ellyn Park District, begins at 4pm at Lake Ellyn Park. A limited number of pumpkins will be available to carve at the event ($5 each, cash only). Learn more at www.gepark.org/flotilla. 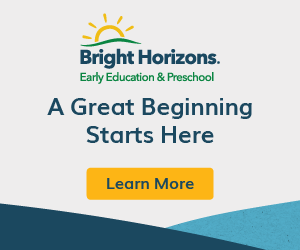 Looking for more fall fun? Check out these activities that run all autumn long. Take a hayride to our pumpkin field, explore the Haunted Barn, pet and feed farm animals, get lost in two corn mazes, enjoy our Ziplines and Giant Mountain Slide, and much more! General Admission includes over 30 unlimited attractions for all ages and is $11.95 Monday through Friday, $14.95 on Saturday, Sunday and Columbus Day. 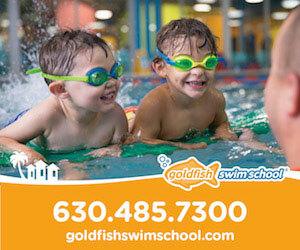 Children 2 and under are free and grandparents are free Monday-Friday (excluding Columbus Day) with a paid grandchild. Looking for more fall fun? 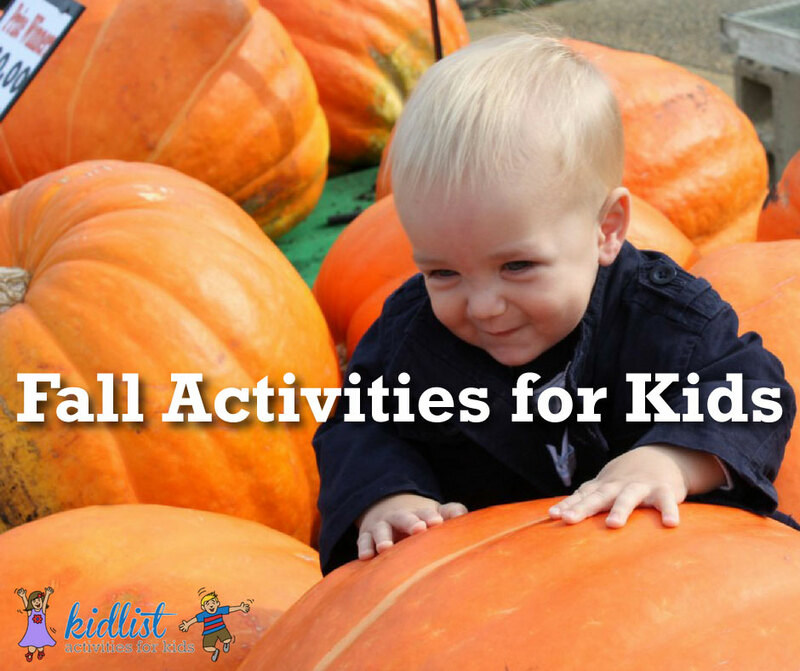 Head over to our Guide to Fall Activities for Kids! Be the first to comment on "2018 Fall Festivals and Oktoberfests in the Western Suburbs"